The holidays are a great time to spend with family and friends and an opportunity to get together and share laughter, joy and gifts with the ones we love. It can also be an expensive time of year so careful planning, spending and creativity is needed to ensure the holidays are enjoyed without a mountain of debt awaiting the New Year. An effective way to ensure a debt free holiday is to implement a holiday spending planner. A holiday spending planner is a comprehensive spending plan that details all expenses related to the holidays. 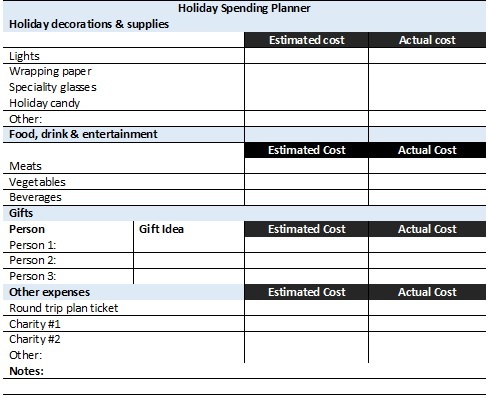 Before you implement your own holiday spending planner, here are a few things to consider. 1. Before you decide what you need to buy for the holidays, it is important to determine what you already have. When making an inventory for the holidays, separate your expenses by category. An example of four categories for holiday spending may be: holiday decorations & supplies, food/drink/entertainment, gift giving and other expenses. Check around the home and make a list of decorations and supplies that can be used. Items like lights, wrapping paper, confetti, speciality dishes, ornaments and holiday home decor etc. Based on what you currently have, make a separate list of what you still need to buy. Simplicity is key. The holidays should be a time to gather with loved ones. Once you have your list, prioritize by most to least important. Since money is limited, this exercise will help to determine whether certain items are needed or not. For those that host for the holidays this can be can expensive time of year. Determine with family members who will be hosting and for which dates. Minimize the cost of food and drink by asking others to bring a dish or a beverage for the event. Take an inventory of non-perishable foods, beverages and entertainment items (i.e. puzzles and board games) that can be used for the event. Based on this, make a list of what needs to be bought. Prioritize by most to least important. If you are hosting, items like meats and alcoholic beverages may consume a big part of the holiday budget. To reduce incurring all of these expenses yourself task others to bring beverages, games and non-perishable food items that can be used on the event date. Buying gifts for others can be fun. However, if not planned in advance, this can lead to debt and stress in the New Year. Take an inventory of unopened gifts you received from previous holidays that someone else would enjoy. Be mindful when re-gifting. Ensure that you do not re-gift to the same person or to someone within the same circle of friends. Make a list of the people you would like to give a gift (gift recipients). Categorize your list from most to least important. You may not be able to get a gift for everyone on your list and that’s okay. The holidays are about spending time with loved ones and creating wonderful memories. Other expenses may occur during the holidays including: plane tickets or bus fare, charitable giving and other costs etc. Prioritize these expenses from most to least important. How much do I currently have saved for the holidays? How much more do I need to save for the holidays? How much time do I have before the holidays? If I need to get into debt for the holidays, how quickly can I pay it off? What expenses can I cut back on right now so I have more money for the holidays? What items on the list can I eliminate? Start from bottom of your list (least important) and work your way up. Based on the questions above, come up with a realistic amount that you would like to spend for the holidays. Figure out how much of this amount you will still need to save, divide it by the number of pay periods leading up to the holidays and incorporate the cost into your household budget. 3. Using your list of items to buy, check online for sales, discount codes and other ways to purchase items for less. For gifts like toys and electronics, Black Friday may be a good time to get major discounts. For holiday decorations and supplies, check weekly flyers for sales. For food items that would be purchased closer to the event, consider buying in bulk with family and friends and splitting the expenses between households. Buying in bulk is a great way to save a lot of money. Include an estimated and actual amount column for each item on your list and add the estimated amounts for each item based on your research. 4. With your list in hand, you are ready to shop for the best deals and save some money. As you make purchases include the actual amount spent in the appropriate column. This information may be helpful for future budgeted amounts. 5. At the end of the holidays, review your holiday spending planner and the estimated versus actual amounts to see what you might do differently in future years. 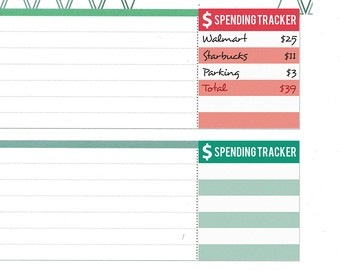 Make a note of areas where you feel you overspent. You can also include effective methods you used to save money including stores that offered you the most savings.